Sorry for the big pictures. 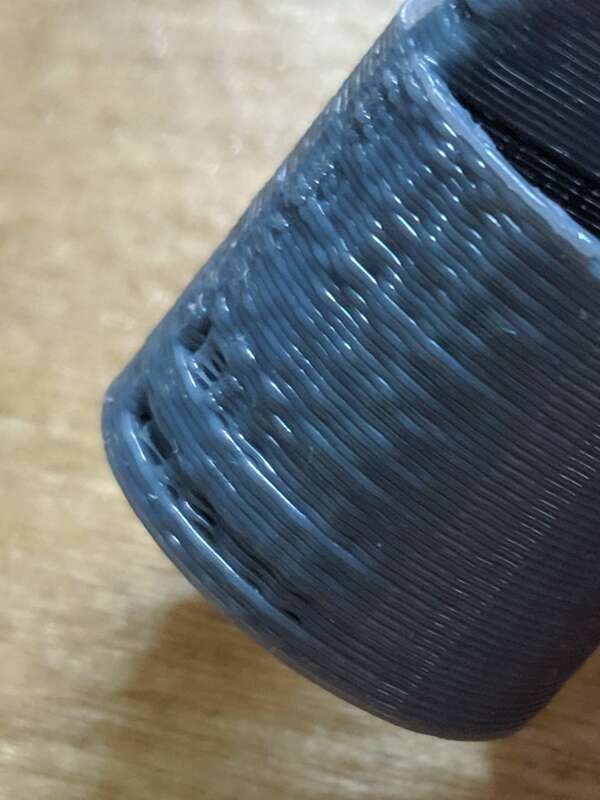 Extrusion just seems wavy and inconsistent. It's a lot worse without pressure advance. (S0.08) It's been awhile but larger parts seem fine, these are quite small, 16mm diameter. I did increase extruder jerk to 2000mm/min which helped a lot, which I thought was interesting. Wondering if anyone has any thoughts. Can you post the STL? Is it fairly low polycount, leading to large segment sizes on the curves? Are you using mesh grid compensation? I notice your Z jerk is rather low, could it be pauses while trying to adjust the z axis? It would also be useful if you could attach the gcode. Thanks. 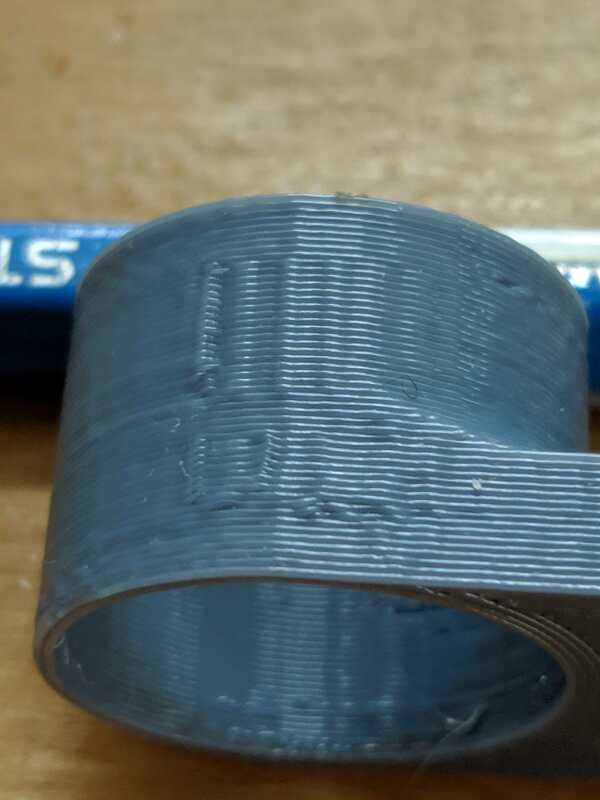 Here's STL and the cura gcode for the small cylinder I'm getting problems with. I'll add to the original post. high polycount, no mesh bed compensation. The Z jerk, just doubled to 48 but no change. Seems to be rumbling in the actual extruder, if that's anything. I'm guessing it's thin wall related. I'm seeing some really tiny extruder moves in the gcode file. What does your gcode preview look like? Thanks for the gcode, in Cura, set Minimum Wall Flow to something like 20 or 30. That should help. @burtoogle you legend. Looking nearly flawless so far. Thank you so much. @Phaedrux thank you for the troubleshooting as well. It means a lot! In case you are wondering what was happening there the problem is how Cura prints walls. It has to print walls in pairs and when there isn't enough room to print both walls it can make the second wall thinner so as to not overfill the space. This is done by the wall overlap compensation (which, incidentally, is pretty buggy but that's another story). In your example, because there is only room for one inner wall, the second inner wall was being flow reduced down to a weeny amount and so for the duration of the printing of the second wall, the extruder was pretty much stationary and so it just dribbled and lost a lot of pressure. When the next wall started, underextrusion occurred. The fix is to tell Cura that any wall line that uses less than a min amount of flow should be replaced with a travel move and that will use retraction so the nozzle pressure isn't lost. It's a crock but that's how it works and I doubt if it will change anytime soon. @burtoogle interesting. Yeah I was trying to figure that out. I'm unclear, though, if the min flow amount is being hit, and by using Minimum Wall Flow, wouldn't the entire middle layer just not print? I'm still seeing the interior layer. That does all seem strange though. Do other slicers have a similar issue? How do those behave in the same scenario? Slic3r is a bit better with thin wall detection and gap fill but it still runs into other issues. When it's working well it would switch to a external wall with a variable width of fill to fill the gap between the walls. It can sometimes help to change the extrusion width up or down a tad. Is it also moving jerkily while it prints the curves? If so, that is a sign that you have the X and Y jerk set too low in the M566 command in config.g.